Editor’s Note: This post was originally published in June 2011 and has since been given a face-lift and updated for accuracy and relevance. 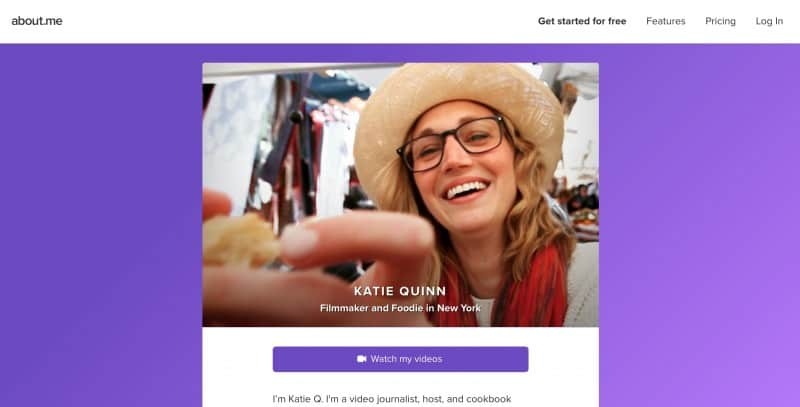 About.me is one of the most popular personal website builders, and it’s no wonder. It has all the most important features, it’s very intuitive and looks great. Basically, it allows you to connect all your online profiles in one place and give them a broader context. Why is that important? Well, you certainly don’t want to be defined by your Facebook or Instagram profiles alone. There is more to you than food and landscape pictures. You don’t want to be defined by your LinkedIn profile either; while you may look very professional and accomplished there, the professional you is just one aspect of your personality. With about.me, the whole you has the opportunity to shine. All you need to start are a picture, links to your social media profiles, short bio and lots of inspiration for creating that “wow” effect with your profile. I cannot do much to help you with the first two but I can help with hacks for writing your “about me” description and the inspiration part. If these 10 creative about.me profiles don’t get your inspiration juices flowing I don’t know what will. 😀 Check them out and leave links to other great profiles in the comments! Not much can beat a selfie from space! Christopher is a man of many talents. During his career, he founded several companies, flew for the Navy, worked for Pentagon, got an MBA from Harvard, started his own venture capital firm and visited Antarctic four times in search for the perfect shot. 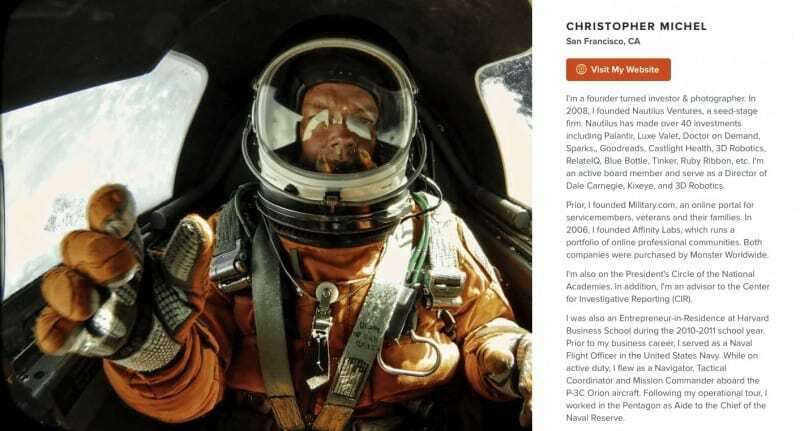 His about.me profile – a striking self-portrait taken 70.000 feet above the Earth and a short bio – gives you a glimpse into his unique set of skills. James’ interest for insect started when he ate one at the age of 9. Affected by the event, he aspired to become an entomologist but was soon caught up in another web – web of media advertising and design. His profile is the perfect example of the way you can display your skills and your personality through clever storytelling and compelling graphics. When James can be characterized by his love for insects, Jasmine is known for her appreciation for… toilets! 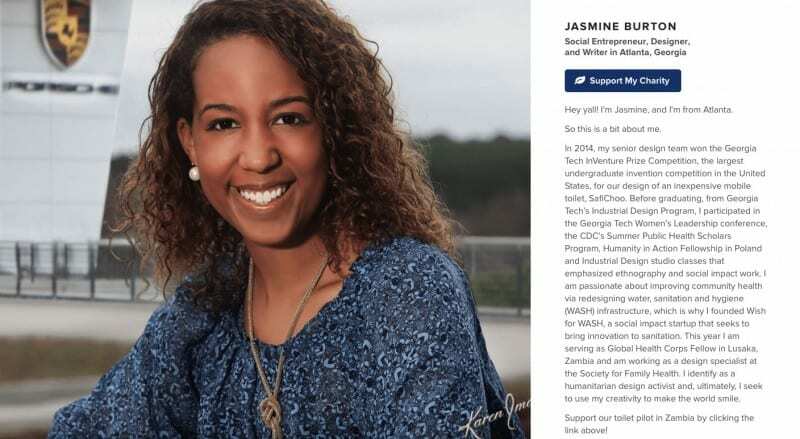 When Jasmine learned that large percentage of pubescent girls often drop out of school because they lack toilets, she made it her 18-year-old mission to design toilets. Since then, she has been working hard on using her knowledge as an industrial designer to redesign water, sanitation and hygiene (WASH) infrastructure in communities that lack the resources to build safe systems for themselves. First steps? Founding a social impact startup Wish for WASH and designing an inexpensive mobile toilet, SafiChoo. Jasmine utilizes her personal brand and influence to support her cause because she knows that people relate to people and their stories. That is why you, as a startup founder and even an employee, play a big role in your company’s or NGO’s corporate brand. What better way to give a first clue into what you do than to include your signature illustration and book character, Muggles, in your about.me profile? Kim is a licensed artist, surface Designer, children’s Illustrator and author. What I like about her profile is that she managed to turn its one page format into a portfolio of her work. Her cover image already tells you a lot about her work, but if you need more information, there are links to her website, projects she is involved in, Amazon author profile, and her latest blog posts. Ken is a commercial travel photographer whose work has been featured in numerous commercial publications, including the New York Times and National Geographic. His profile is the perfect example how you don’t need many words to say everything that needs to be said. His picture shows Ken in his natural setting – capturing the allure of his newest destination, while various links that he provides direct you towards places where you can find out more about his work. What I love is that he uses a call-to-action button to invite you to take a look at his travel blog, as well as an RSS feed to always have the latest posts displayed on his profile. 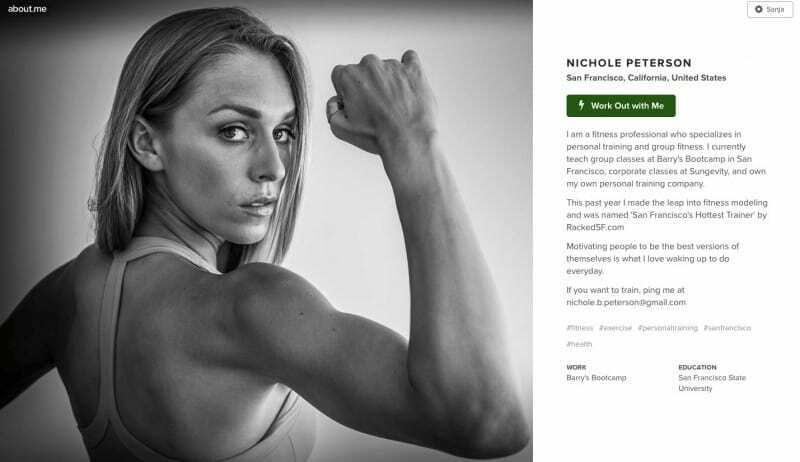 Nichole uses her about.me account to drive her business as a personal trainer. She does that by demonstrating her credentials – where she works, professional recognition and what she personally achieved fitness wise. She also uses a CTA to invite people to apply for her training program or to contact her at her email. If you don’t feel comfortable leaving your email on the web, you can always present it in a “your name (at) your domain (dot) me” format. When he got his first violin at the age of 6, CheHo Lam could not imagine that this instrument would take him from his family in Hong Kong to New York, on the other side of the globe. Today, he is an award-winning violinist who performed in venues ranging from Carnegie Hall and The White House, to classrooms and hospitals all over the world. What you can see from his example is also a clever use of about.me’s backstory option, which serves as resume of sorts where you can list all you future and current business endeavors. You know what I love about this profile? The life bursting from it. Starting from the picture, Olivia shares her approach to life – joyful and healthy. In her bio she gives more information about herself with a special emphasis on her values and beliefs; something that, as a potential employer or business partner looking at the profile, can tell you if you would be a right fit or not. Olivia is a full-time blogger, sharing practical tips for sustainable and healthy living, inspired by her everyday adventures. Using a CTA button, she invites us to take a look at her blog or take a look at her social media accounts, which are an integral part of her online brand. Very simple, yet effective. I chose Christian’s profile because it’s minimalistic but completely serves the purpose – it provides a context. The image he chose perfectly communicates both his love for photography and multimedia. While his bio is short and focused on his professional achievements, he offers links to various online profiles where you can find out more about him, but all in the context he already presented. Another minimalistic one but filled with useful information. Katie made a great introduction by writing about her profession and briefly sharing her personal thoughts and beliefs. She gives us a short insight into her work and passions, but allow us to find out more by perusing her social media accounts and YouTube channel. Back to you! What about.me profile would you add to our list? Comment and share it! You can always submit yours after creating it at about.me. Digital marketing professional with a passion for technology, creative challenges, and giving back to the community.